English, Henry VII, AD 1489 to 1509. Silver groat. 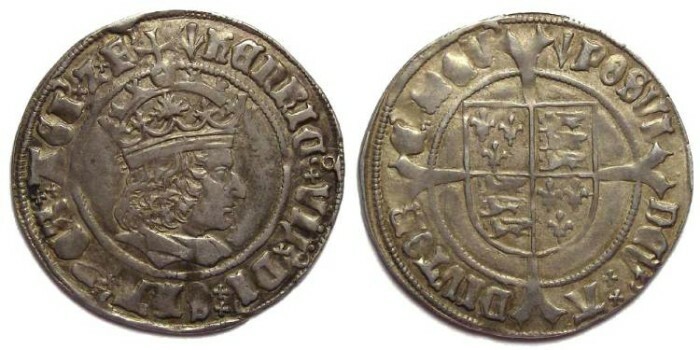 Denomination : Silver Groat. Mint : London. Date : Intial mark "Pheon" used from 1505 to 1509. Size : 26.7 x 27.5 mm. Weight : 3.12 grams. Grade : gVF with a reasonably good strike. Obverse : Profile bust of Henry VII, with HENRIC VII DI GRA REX AGL Z F around. Reverse : Long cross on a shield, with POSVI DEV ADIVTORE MEV (Latin for I HAVE MADE GOD MY HELPER) around.